© 2012 by Abbas Hussain; all rights reserved; content may not be copied, rewritten, or republished without written permission. When doing your home repairs and renovations you may decide to install a steel garage to replace the one that you may be currently using. Why? 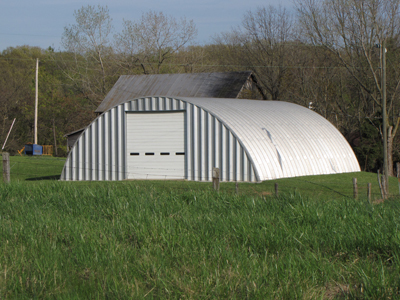 Because of the many benefits that come with having a strong metal detached building as opposed to any other type. It may look like quite a daunting task to have one built for you, but with the right expertise you have nothing to worry about. Instead you should be ready to enjoy the numerous benefits that comes with this home improvement. You can be sure that this is one decision that you will make and never regret as the benefits will surpass whatever time and money you will spend. The benefits that come with such a replacement or initial installation are quite numerous. However, among the numerous benefits one of the major ones is enhanced security. It will provide all the security you could want for whatever you intend to use your space for. You might park your car in it or for storing tools or other items that you may not be using at the moment. The fact that the garage is made of steel will ensure that intruders are kept at bay with ease. This is opposed to buildings constructed of wood, as they can be vandalized with ease, hence your property will not be safe at all. Metal construction is bound to last much longer than any other due to the materials used in building it. The steel will last for quite a long time without needing any kind of replacement. However, a garage made out of wood or a synthetic material like fiberglass is bound to last only for a short period of time comparatively. With wood you stand the risks of rotting and vandalism. This will only end up being unnecessarily expensive for you as you will need to spend money every time the garage needs to be repaired. Maintenance of a steel structure is much easier than any other garage. This is due to the fact that it will not need maintenance for a long time and when it does it will probably be a paint job alone. This is the exact opposite of a wooden building which not only needs painting but also have various pieces of wood replaced or even the whole structure rebuilt as a result of termites eating into the wood or rotting as a result of dampness. Stability is never compromised when it comes to steel garages as is not the case with wooden buildings. After rotting, a wooden garage may collapse and in turn damage your property making you incur losses which are uncalled for. Fire is always a possibility and concern with these structures. Homeowners often store things like paint thinner and lawnmowers and the accompanying gasoline cans in these spaces. There is always the possibility that you can get a financial break on your homeowners insurance policy due to this fire resistance. These are all compelling reasons as to why you should go for a garage made out of steel when doing repairs as well as renovations for your home. Abbas is a blogger who talks about the benefits of having a steel garage for your home. He also talks about steel framed buildings for Cyclone Steel Buildings.